As you likely have heard, Salt Lake County will be selecting a site for a possible homeless shelter. Three of the potential sites chosen by the County are located in West Valley. The announcement of the County's recommended site will be made either late tonight or tomorrow (Friday) morning. I have attended four of the public comment meetings / open house meetings. I greatly appreciate all those who: (1) have reached out to me about your thoughts; and (2) come to one of the many public meetings to express your views to the County decision-makers. In addition to regularly expressing my views, I wrote a letter to the Site Evaluation Committee. I thought it would be helpful for my constituents to see the correspondence. This expresses many of my thoughts. First of all, thank you for your service on this committee. I certainly appreciate the difficult task you have. As you know, three of the proposed shelter sites fall within West Valley City. In my opinion, the County-designated West Valley sites, if selected, will not only fail to achieve the desired outcomes, but will create more problems than they solve. In its quest to “get it right,” Salt Lake County set forth numerous written “site evaluation criteria” to guide its decision. As one walks the neighborhoods of the proposed sites, one can feel that a homeless shelter isn’t a good fit. However, most concerning is that the proposed West Valley sites fail to fit the objective criteria that the County itself created. Must be Near Public Transportation – The Printers Row location is particularly problematic in this regard. The proposed site is nearly 1 mile from the nearest Trax station. Must be Near Groceries – The County indicated the new facility will “provide food services, with space for limited meal preparation and consumption of three meals a day.” Accordingly, access to groceries has been deemed a “must” by the County. However, the nearest full-service grocery store to any of these proposed sites is at least 2 miles away. Another criterion set forth by the County is that the shelter must “fit within the existing [neighborhood] environment.” Accordingly, impacts on existing neighborhood schools, churches and businesses must be taken into consideration. Schools – There are six schools within 1.5 miles of the proposed homeless shelter sites. By most reports, the population to be serviced by the homeless shelter will be single men. This is a concern for school administrators and parents of children who will be walking past or near the homeless shelter. One specialized charter school whose students are primarily new or expecting mothers (and located within two blocks of a proposed site), may be particularly vulnerable. Churches – There are seven churches near the proposed sites. One example is the Khadeeja Islamic Center. This amazing mosque, situated within two blocks of one of the proposed sites, provides both worship service facilities and a school for their children. Several members of the Islamic Center attended a recent open house to let County leaders know how their mosque, and their members, will be negatively impacted. Businesses – Several incompatible businesses are situated within blocks of the proposed sites. This includes three daycare facilities, multiple distilleries, small arms manufacturers, the Work Activity Center (which provides services to hundreds of disabled individuals), and an armored car service. Several business owners in the area have shared with County leaders how their businesses and customers will be negatively impacted. Indeed, the three proposed West Valley sites are in areas that can be considered a “business park.” Many of these businesses have indicated that if the shelter is placed within the business park, their businesses will be forced to relocate. The Jordan River & Jordan Parkway – Countless resources have been spent trying to clean up the Jordan River and the Jordan Parkway. It is clearly counterproductive to put a homeless shelter in an area where we have so aggressively tried to have less homeless. West Valley is willing to be part of the solution regarding homelessness. In fact, West Valley Mayor Ron Bigelow pledged at the recent public comment meeting that West Valley City is willing to commit its time and dollars to address the homelessness issue. But Salt Lake County chose these locations without any input from the affected communities prior to being selected. Since the County has failed to follow its own site evaluation criteria, the proposed West Valley sites, if selected, will not only fail to achieve the desired outcomes, but will create more problems than they solve. Thank you to those who have come to the meetings! Below is a photo of one of the previous meetings. As you can tell, there has been good turnout. This is a big deal for our community. Thanks to the City Council, the City Mayor and all West Valley state legislators (republicans and democrats) who are standing together on this issue. 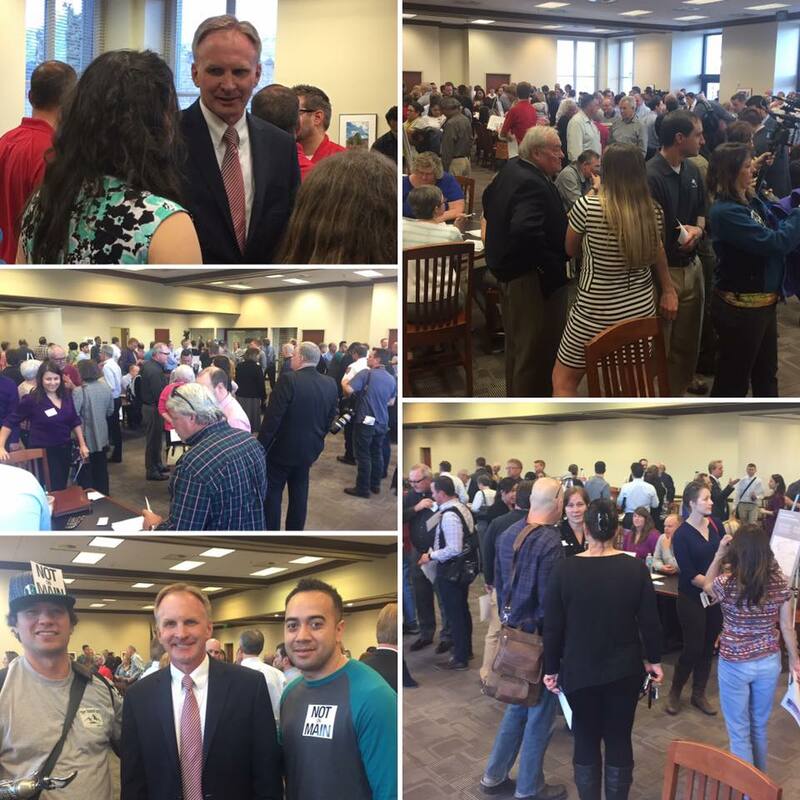 And a special thanks to the West Valley residents who traveled to let the County decision-makers hear your voice! Thank you! !